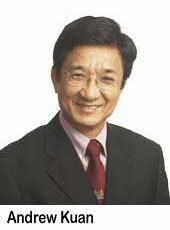 Andrew Kuan is former Group Chief Financial Officer of JTC, a multi-billion real estate and infrastructure corporation. He oversaw the Group’s broad-ranging financial management, corporate finance, investments and corporate governance. He also has worked in top financial positions with prominent multi-national corporations like Betz, Gould Medical and Bausch & Lomb. Andrew has been a professional adviser to the President of a high-tech MNC and advised the Chairman of a promising local enterprise. He has served as a member of the editorial board of advisers of CFO-Asia at The Economist Group as well as a resource panel member of the Government Parliamentary Committee for Finance and Trade & Industry for the term of 1997/98. He was also a member of Statutory Boards Accounting Standards Review Committee, Ministry of Finance in 2003, contributing his years of experience to the fine-tuning of government policies. Andrew has managed to juggle his demanding career commitments with balanced family life and active community involvement. He has served nine years as a Town Councillor and Chairman of its Finance Committee where he oversaw the financial management and investments of two town councils. With a keen interest to share his passion and experience in ABM, EVA, BSC and financial management, he has lectured at IBM, Yokogawa, The RMIT University-SIM’s Bachelor of Business programme, The University of Wales – Master of Science (Health Care) programme, and for the Dentistry Faculty at the National University of Singapore in the General Practice Management Course. Terima kasih sokongan anda semua, 谢谢您的支持 Thank you for your support.